Main Street Delaware volunteers spent Wednesday decorating the 30-foot tall spruce tree that currently sits on the corner of South Sandusky Street and West William Street. 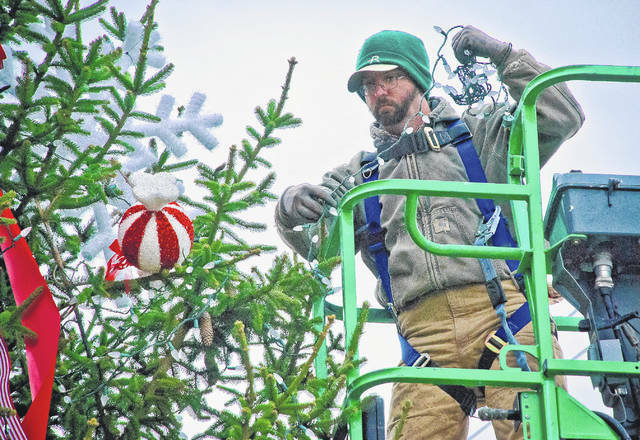 Colin Shea of Rine Landscaping Group used a lift to string the lights, which he said he tested before putting them on the tree. The tree-lighting ceremony is scheduled for 6:30 p.m. on Friday, Dec. 1 during First Friday. Chilly and cloudy conditions on the day before Thanksgiving didn’t put a damper on the holiday spirit for the volunteers who showed up to decorate Delaware’s community Christmas tree. The nearly 30-foot tall spruce is now properly dressed for the season and ready to be lighted during Main Street Delaware’s December First Friday, which is the kickoff for a full weekend of activities during Home for the Holidays, said Executive Director Susie Bibler. The tree-lighting ceremony is planned for 6:30 p.m. next Friday. Downtown visitors will have the chance to lace up their ice skates and hit the Glice next weekend, Bibler said. The synthetic, all-weather ice skating surface made by Swiss company Glice will be laid at the Willis Education Center. The skating rink will be open from 6 to 9 p.m. during First Friday; noon to 9 p.m. on Saturday, Dec. 2; and noon to 6 p.m. on Sunday, Dec. 3. Bibler said admission is free, but donations will be accepted to help offset the cost of renting the surface. Bibler said another new facet for First Friday is a main stage located at the corner of Sandusky and William streets. Area singing groups and other entertainment will be featured throughout the evening. Adding to the fun is the Coca-Cola Christmas Caravan, Bibler said. Bibler said two live reindeer will be part of the Friday activities. Visitors will have the chance to feed the deer. The Santa House at The Strand Theatre will open for the season on Saturday, Dec. 2, Bibler said. It will be open from 1 to 3 p.m. each Saturday until Dec. 16 and 6 to 8 p.m. each Friday, Dec. 8, 15, and 22. Home the Holidays will feature the Dash for Dasher, a children’s scavenger hunt through the downtown area on Saturday, Dec. 2. Bibler said the premise is that Santa’s reindeer Dasher is lost and the kids will collect clues to find him. Participants can pick up the first clue from 11 a.m. to 1 p.m. at the Main Street Delaware office, 20 E. Winter St. Admission is free, but Bibler said Main Street is accepting donations of cereal for People In Need. The weekend wraps up with the annual Christmas parade beginning at 3 p.m. on Sunday, Dec. 3. Bibler said this year’s grand marshal is Ashleigh Hunt, a Hayes High School alumna who is battling osteosarcoma, a rare type of bone cancer. Bibler said the parade’s “grand furry marshal” will be Mozart, a yellow lab who was the winner of the Pet Walk during the September First Friday. For information about Main Street Delaware’s Home for the Holidays, go to www.mainstreetdelaware.com.